Prayer leads to faith, faith leads to love, love leads to service and service leads to joy." 1. Prayer: daily regular prayer, reflection, quiet presence, scripture reading, listening to God in love. Remember the person who does not pray cannot discern the will of God. 3. Journalling: Spend some time writing about your experiences, this makes them concrete and I can look at what blocks me from inner freedom and compassion. It is not diary of events, it is allowing my unconscius to flow from my heart. 4. Spiritual Direction: This is a process where a person can be helped and encouraged to find their vocation in life. 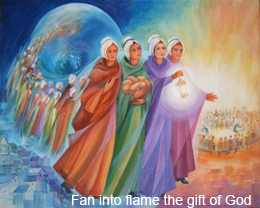 The Holy Spirit guides through the situation and experiences of each person. Spiritual Direction helps clarify what one is experiencing and move further along the journey of finding the will of God daily. 5. Dreams: These can be helpful in developing an awareness of what is going on in my unconscious and listen to my inner self. Dreams are a free expression of the inner workings of life and the material can be very worthwhile spending time with. 6. Inner Healing: is a way of healing memories, of processing past hurts which are real and recognised or not. This leads to an inner freedom when done in the presence of God and leads to new life and inner freedom and joy.